Gradually varied flow water-surface profiles are expressed in terms of the critical slope Sc. In this way, the flow-depth gradient dy/dx is shown to be strictly limited to values outside the range encompassed by Sc and So, in which So is the bed slope. This new approach improves and completes the definition of flow-depth-gradient ranges in the analysis of water surface profiles. Online calculators are provided to round up the experience. Computations of gradually varied flow (GVF) are part of the routine practice of hydraulic engineering. The GVF equation describes steady gradually varied flow in open channels (Chow 1959; Henderson 1966). The conventional GVF equation is expressed in terms of bed slope So, friction slope Sf, and Froude number F. Herein, the GVF equation is alternatively expressed in terms of bed slope So, critical slope Sc, and Froude number F. Analysis of this equation reveals that the flow-depth gradient dy/dx is strictly limited to values outside the range encompassed by So and Sc. This improves and completes the definition of flow-depth-gradient ranges in the analysis of water surface profiles. in which R = A/P = hydraulic radius, and P = wetted perimeter. which is strictly valid for the following condition: P /T = Pc /Tc . This latter condition is generally satisfied in a hydraulically wide channel, for which T is asymptotically equal to P.
Equation 10 is the GVF equation in terms of bed slope So , critical slope Sc , and Froude number F. The bed slope could be positive (steep, critical, or mild), zero (horizontal), or negative (adverse). The critical slope (Equation 5) and Froude number squared (Equation 3) are always positive. Equation 10 is used to develop a classification of water-surface profiles based solely on the three dimensionless parameters: Sy /Sc , So /Sc , and F. For the sake of completeness, subcritical flow is defined as that for which the flow depth is greater than the critical depth (F 2 < 1) (Chow 1959; Henderson 1966). Paralleling this widely accepted definition, subnormal flow is defined as that for which the flow depth is greater than the normal depth [F 2 < So /Sc ]. Supernormal flow is defined as that for which the flow depth is smaller than the normal depth [F 2 > So /Sc ] (USDA SCS 1971). Table 1 shows the possible types of water-surface profiles. Table 1. Possible types of water-surface profiles. A summary of the twelve possible water-surfaces profiles is shown in Table 2. The classification follows directly from the governing equation (Equation 10). It is seen that the general type of profile (Type 1, 2, or 3) determines the sign of Sy /Sc (Column 2) and thus, the classification of either backwater or drawdown (Column 3). Also, the general type of profile determines the feasible range of So /Sc (Column 4) and thus, the existence of specific profiles types (Steep, Critical, Mild, Horizontal, or Adverse) within each general type. Note that not all combinations of Sy /Sc and So /Sc are feasible. Unlike the description available in standard references (Chow 1959; Henderson 1966), the flow-depth gradient ranges (Table 2, Columns 7 and 8) are now complete for all twelve water-surfaces profiles. Significantly, the flow-depth gradient Sy is shown to be outside the range encompassed by Sc and So . Figure 1 shows a graphical representation of flow-depth gradient ranges in the water-surface profiles. The arrow shows the direction of computation. For instance, the depth gradient for the S3 profile (supercritical/supernormal) decreases from Sc (a finite positive value) to 0 (asymptotic to normal flow). Likewise, the depth gradient for the C1 (subcritical/subnormal) and C3 (supercritical/supernormal) profiles is constant and equal to So = Sc . Online water-surface profile calculators are enabled in Table 2. Table 2. Classification of water-surface profiles. 1 Given that So /Sc > F 2 > 0, no horizontal or adverse profiles are possible in subcritical/subnormal flow. 2 Given that So /Sc > 1, no critical, mild, horizontal or adverse profiles are possible in supercritical/subnormal flow. 3 Given that So /Sc < 1, no steep or critical profiles are possible in subcritical/supernormal flow. 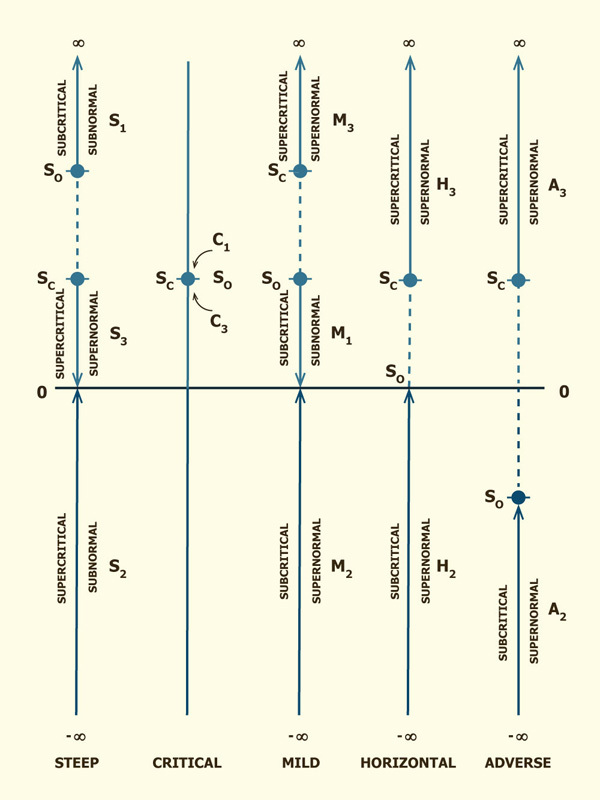 4 Given that So /Sc is not limited, all five profiles are possible in supercritical/supernormal flow. The gradually varied flow equation is expressed in terms of the critical slope Sc . In this way, the flow depth gradient dy/dx is shown to be strictly limited to values outside of the range encompassed by So and Sc. This completes the definition of depth-gradient ranges for all water-surface profiles. For instance, the flow-depth gradient for the S3 profile decreases from Sc (a finite positive value) to 0 (asymptotic to normal depth). Likewise, the flow depth gradient for the C1 and C3 profiles is constant and equal to So = Sc. Table 3 shows a summary of water-surface profiles. Online calculators are provided to round up the experience. Table 3. Summary of water-surface profiles.